DOSBox-X v0.82.13 (2018/12/30) is released. 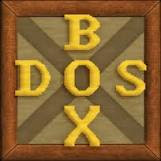 DOSBox-x is a branch of DOSBox. DOSBox emulates an Intel x86 PC, complete with sound, graphics, mouse, joystick, modem, etc., necessary for running many old MS-DOS games that simply cannot be run on modern PCs and operating systems, such as Microsoft Windows XP, Windows Vista, Linux and FreeBSD.